It's goo week here at Rosin Cerate. So far we've looked at forms of natural springtime goo. For today's post, it's on to a much darker and less life-affirming goo. We're going to take a peek at the viscous fluids you can extract from a corpse to determine where/when/how it became a corpse and other useful forensic information. Blood is often used for postmortem analyses, but sometimes this isn't possible. A corpse may have bled out or become fragmented, limiting the amount of blood available. In other cases, the growth of microbes and/or breakdown of blood components (autolysis) as part of decomposition may render the blood unusable for analysis. 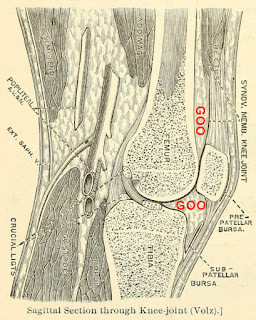 This is where various gelatinous substances contained within the human body come into play: vitreous humour in the eyes, synovidal fluid in the joints, and marrow in the bones. All of these fluids are found within relatively isolated and/or protected areas of the body, meaning it usually takes longer for them to break down or become contaminated after death (as compared to blood). They also tend to stay in the same place. The fluids, being at least somewhat connected with the bloodstream, contain many of the same blood-borne compounds (drugs, hormones, etc.) used to obtain information about a corpse. Each of your eyeballs contains two chambers separated by a light-focusing lens. The larger chamber behind the lens is filled with ~4 mL of a gel-like substance called the vitreous humour. It ensures your eyeball doesn't deflate and your retina, the tissue layer at the back of the eyeball where the light of everything we see is detected, doesn't move around. 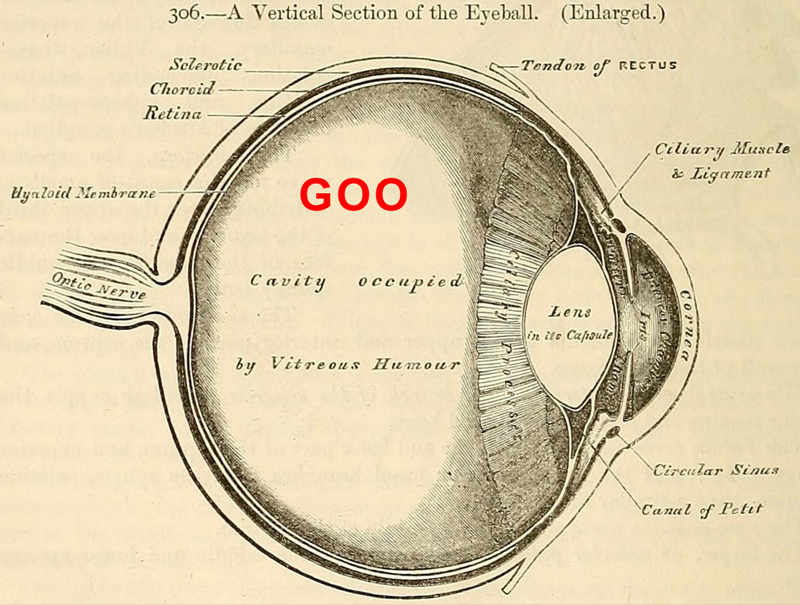 Vitreous humour is mostly water but has a gooey consistency thanks to the presence of protein threads, most of which are collagen linked with hyaluronic acid (a glycosaminoglycan). It also contains electrolytes, glucose and other sugars, a protein by the name of opticin, and a few cells (which make vitreous humour ingredients and help minimize inflammation within the eyeball). Small compounds are able to move between the vitreous humour and blood vessels at the back of the eye, but it's otherwise closed off by the selective blood-retinal barrier. The vitreous humour ages along with the rest of the body, resulting in floaters. To collect vitreous humour from the eyeball of a dead person, a syringe fitted with a needle is inserted into the center of the eye. The fluid is withdrawn slowly so as to not contaminate it with cells from the retina or iris. Vitreous humour can be used to obtain all sorts of information, including the approximate postmortem interval (time since death), the identity of the deceased (by extracting and sequencing DNA), and the presence of various medicines, recreational drugs, and poisons. Further, the fluid can be used to determine if a deceased person was pregnant (by measuring the concentration of chorionic gonadotropin), infected with HIV (by looking for anti-HIV antibodies) or was a heavy drinker (by measuring zinc or carbohydrate-deficient transferrin concentrations), and establish if they died from conditions as diverse as anaphylactic shock, hypothermia, drinking bleach, or traumatic brain damage. Specific advantages of using vitreous humour to figure out a dead person's backstory are it's easy to collect, doesn't contain many of the compounds capable of messing up chemical analysis, and is fairly disconnected from the rest of the body and so can be used if contamination, say with embalming chemicals, is an issue. The bones within our bodies join with one another at joints. 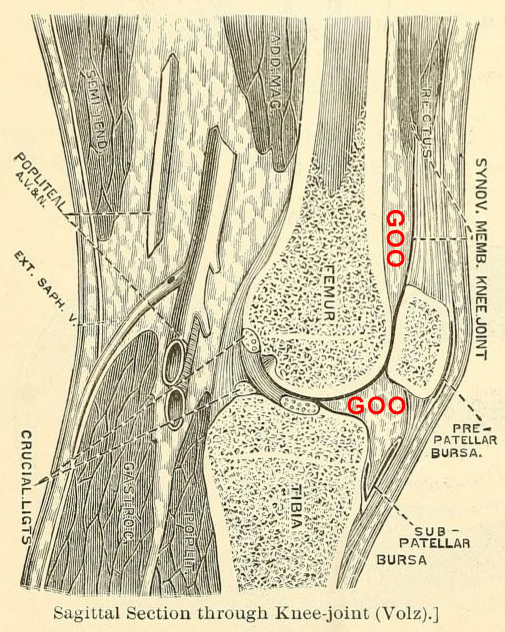 While some joints consist of bones being directly linked together by connective tissue (e.g. skull sutures), at synovial joints the uniting bones are separated by a slime with the consistency of egg white. This is synovial fluid (or "joint oil"). The fluid lies within a capsule of connective tissue spanning between the bones, permitting a fairly wide range of motion. It functions as a lubricant and also provides a means of getting nutrients to cartilage in the joint. Synovial fluid is derived from plasma, the liquid part of blood. It's secreted by cells lining the joint cavity and contains lots of hyaluronic acid and lubricin, which are primarily responsible for making it so slick and gooey. Synovial fluid can be extracted from the knee joint using a needle attached to a syringe. It's more viscous than the vitreous humour, which can complicate its analysis. There is some evidence suggesting synovial fluid, like vitreous humour, can be used to estimate the postmortem interval. This is based on changes in the concentrations of potassium and glucose over time after death. Synovial fluid can also be used to establish if a person used drugs such as cocaine and heroin before they died. Bone marrow is a soft and fatty gel present within bones (collectively it's ~4% of your total body weight). It's contained within spongy (cancellous) bone or the central cavity of long, dense, and hard bones such as the femur. It comes in two varieties, red and yellow. Red marrow is where red and white blood cells are produced. The method of collecting bone marrow for forensic analysis depends on the bone. It can be removed from a fermur after cutting the bone open, squeezed out of ribs using pliers, or withdrawn from vertebrae using a needle and syringe. Bone marrow can be used to detect drugs and alcohol. It can also provide information about the cause of death, particularly if it's the result of drowning (look for diatoms or aquatic bacteria), certain types of cancer, a widespread bacterial infection, or anaphylactic shock. One of the advantages of using bone marrow is it sticks around even if there's only a skeleton remaining (skeletonization) or all other body parts have undergone extreme putrefaction or have been eaten by animals. It's a good place to look for drugs and poisons since it's well-connected to the bloodstream and contains lots of lipids (meaning it will take up hydrophobic compounds). In one particularly disturbing case I came across, bone marrow was used to detect a sedative called triazolam in skeletal remains buried for 4 years in a forest in Japan. It turns out the two victims had been sedated and then buried alive. Deking J, Hargrove VM, Molina DK. 2014. Synovial fluid: An alternative toxicologic specimen? American Journal of Forensic Medicine and Pathology 35(2):154-156. Madea B, Kreuser C, Banaschak S. 2001. Postmortem biochemical examination of synovial fluid - a preliminary study. Forensic Science International 118(1):29-35. Tumram NK, Bardale RV, Dongre AP. 2011. Postmortem analysis of synovial fluid and vitreous humour for determination of death interval: A comparative study. Forensic Science International 204(1-3):186-190.